Being rather fond of horror and particularly horror film festivals, we're happy to pass on a press release that landed in our inbox detailing an announcement by the Cambridge Film Trust and Broadway Nottingham of a Halloween Gothic Film Festival Extravaganza at Kirkstall Abbey, Leeds on 31st October to 3rd November. Kirkstall Abbey’s Gothic Film Festival, set against the spectacular backdrop of the 12th century ruined Cistercian monastery in Leeds, offers audiences a unique and terrifying Halloween trick or treat experience. A key component of the BFI's blockbuster GOTHIC: The Dark Heart of Film project, bringing the dark heart of film to life on the big screen, the 4-day Gothic Film Festival runs 31st October – 3rd November and is presented by the Cambridge Film Trust and Broadway Nottingham, in association with the National Media Museum Bradford and Showroom Sheffield with support from BFI Film Forever. 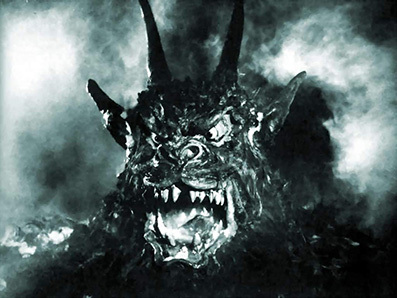 The bloodcurdling programme will also see screenings of classic Gothic titles; Night of the Demon (Jacques Tourneur), Witchfinder General (Michael Reeves), The Devil Rides Out (Terence Fisher), Bride of Frankenstein (James Whale), Passion of Joan of Arc (Carl Theodor Dreyer) with live piano accompaniment by Stephen Horne, and The Innocents (Jack Clayton). A special Junior Gothic event on Saturday 2nd November with screenings for under 16s, including Nosferatu with live piano accompaniment by John Sweeney. The event will also include prizes for best dressed and most scary Goth. The Festival will cater for the full Gothic experience with storytellers and performers in character, Gothic film extracts and trailers in the Abbey’s Chapterhouse and hot food and drink stalls, with added horror atmospherics of fog machines, dramatic lighting and spooky soundscape to create the perfect Gothic film setting. Kirkstall Abbey is located 3.5 miles from the city centre off the main A65 road, adjacent to Abbey House Museum. You can find more information here.